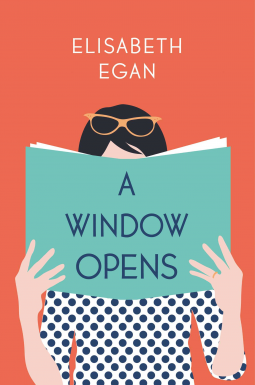 What They Say....In A Window Opens, Elisabeth Egan brings us Alice Pearse, a compulsively honest, longing-to-have-it-all, sandwich generation heroine for our social-media-obsessed, lean in (or opt out) age. Like her fictional forebears Kate Reddy and Bridget Jones, Alice plays many roles (which she never refers to as “wearing many hats” and wishes you wouldn’t, either). She is a mostly-happily married mother of three, an attentive daughter, an ambivalent dog-owner, a part-time editor, a loyal neighbor, and a Zen commuter. She is not: a cook, a craftswoman, a decorator, an active PTA member, a natural caretaker, or the breadwinner. But when her husband makes a radical career change, Alice is ready to lean in—and she knows exactly how lucky she is to land a job at Scroll, a hip young start-up which promises to be the future of reading, with its chain of chic literary lounges and dedication to beloved classics. The Holy Grail of working mothers—an intellectually satisfying job and a happy personal life—seems suddenly within reach. What I Say....I really enjoyed this book. Alice has the best of both worlds, she works part time reading books for a living and spends the other half being a stay at home mom, and helping her friend run a reading and wine night in her bookstore. Then one day, Alice's husband has a work meltdown that culminates in him throwing a computer across the room, ending his high paying job at an upscale law firm and life as Alice knows it. Nick decides that this is the perfect time for him to start his own law firm, and suggests that Alice return to the workforce full time in order to make up the difference in their income. Alice is not excited about this idea, but her panic about money gets her on board quickly. She is fortunate to find a new job at a start up of a new book store, Scroll. This job should be a dream come true, but Alice is ambivalent from the start. As she attempts to maneuver through a younger work force, while still giving her family the same amount of attention, she finds out what most of us already know - it's not as easy a it looks, and some part of your life always suffers. Work isn't any type of escape for Alice either, as she struggles to get on board with selling ebooks instead of what she truly loves, paper books. Her boss displays the usual bipolar characteristics, and then the company decides to make a complete change and leave the e-bookstore concept behind and become a video game store, an idea that Alice truly struggles with. The one thing I really liked about this book was that it reflected real life. Alice's husband begins flirting with alcoholism, her beloved father's cancer returns. And she is feeling the burden of being the sole financial support for her family, while realizing that she is missing important parts of her children's every day lives. Life isn't always easy, and sometimes when bad things happen, they seem like they come in waves. Ultimately, Alice has to decide what her priorities are, and what does she truly want for her own life? This a decision we all struggle with, but I think most of us just continue plodding along, undecided. Another great debut author! I enjoyed this book so much I'll be holding a giveaway - so sign up for a chance to win a copy!